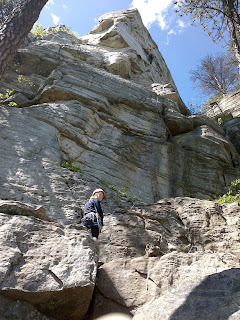 I'm finally headed to Ohio to resume my hike to Wisconsin on the North Country Trail. 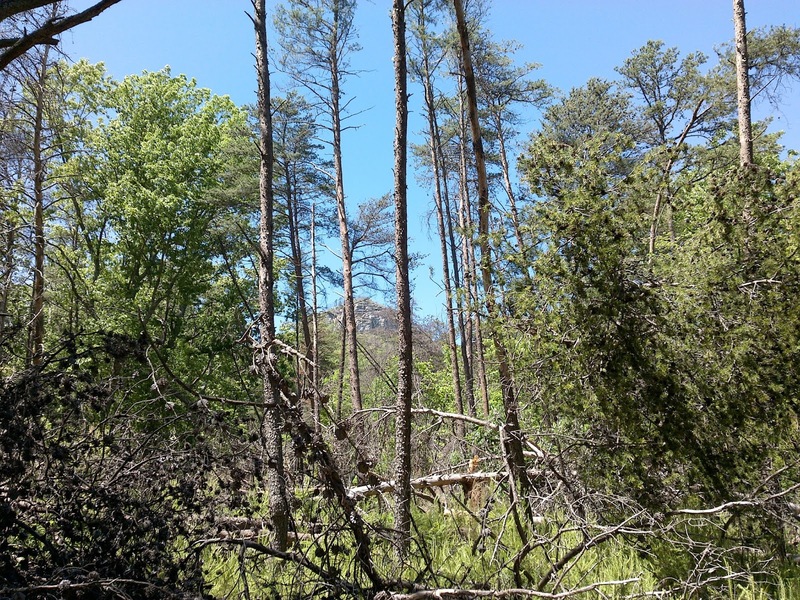 My drive took me past a familiar old hiking spot--perfect for an afternoon hike on a perfect spring day. 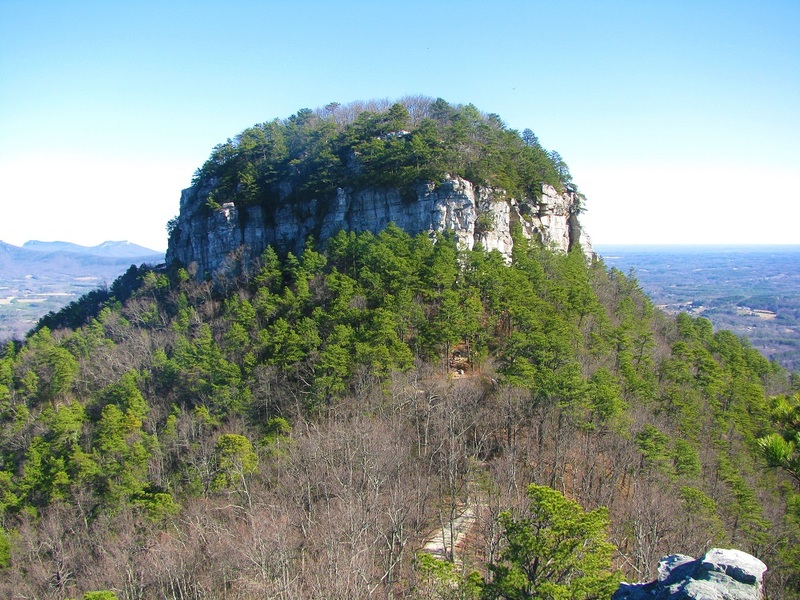 It's called Pilot Mountain, and it's one of those iconic landmarks that stick in your memory. 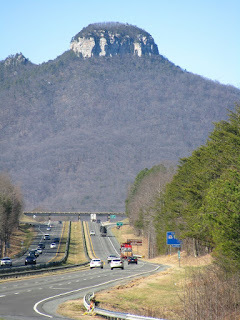 I first saw it driving up US 52 between Winston-Salem and Mount Airy on my way to resume my double thru-hike of the Appalachian Trail back on January 29th, 2012. 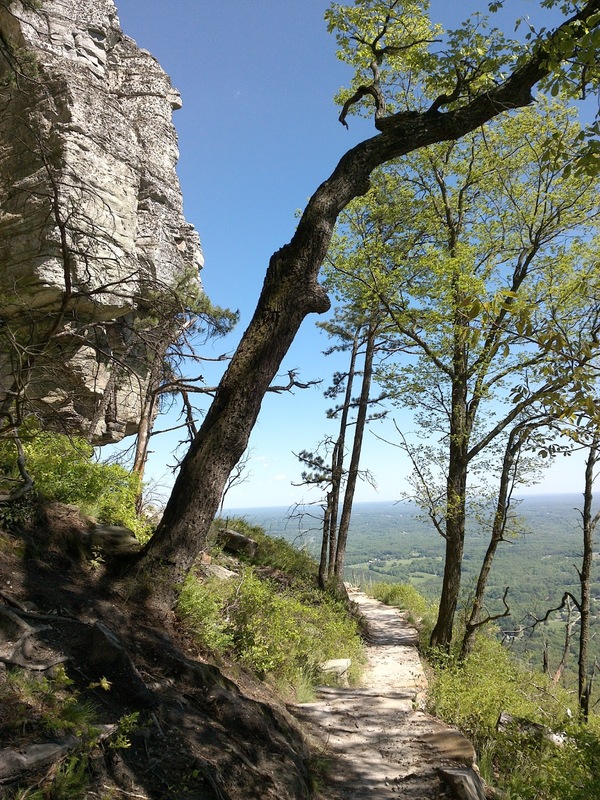 At the time I had never heard of Pilot Mountain. I didn't know it was there, and I certainly didn't know that it was along North Carolina's state trail, the Mountains-to-Sea Trail. I was just passing through on the way back to the AT when I got gob-smacked by this view. Spectacular, particularly after six hours of boring driving. I simply had to stop in for a closer look. 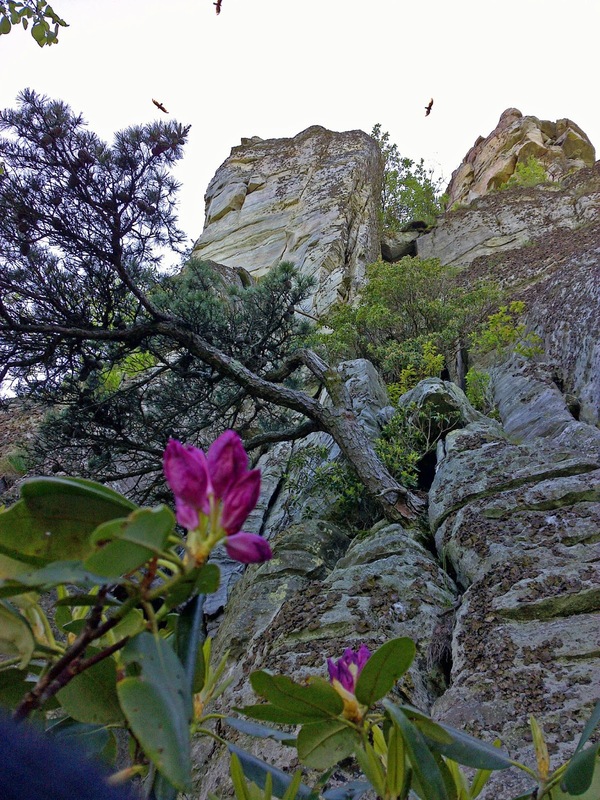 The view from the overlook on the secondary butte (at left in the photo above) was picture-perfect. The headline photo shows what I could see that clear crisp January at midday. A fifty mile view, including Hanging Rock State Park--the mountains in the distance at left. 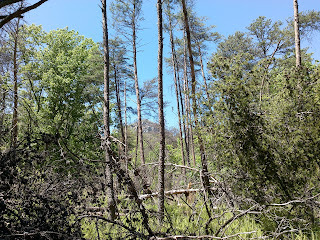 There was a ranger stationed beside the summit parking lot answering visitor's questions that day. I learned that you can't get to the top. The view from the summit isn't all that great anyhow since it's a wooded mound. There is, however, a trail that loops around just below the base of those cliffs. That day I didn't have time to do that hike. The Appalachian Trail was my laser-focus. But I knew I wanted to come back and hike that loop. Fast forward two and a half years. When I hiked across North Carolina on the Mountains-to-Sea Trail in 2014, I did return. It was a pretty spring day. But I found a surprise and a disappointment. The Mountains-to-Sea Trail makes a wide swing around the base of the mountain, but it never gets closer than a half mile from the summit. Here's the only glimpse you can get, and you have to know where to look. Again I was in a bit of a hurry that day, and didn't take the time to take the side trip up to the summit parking area and hike that loop. 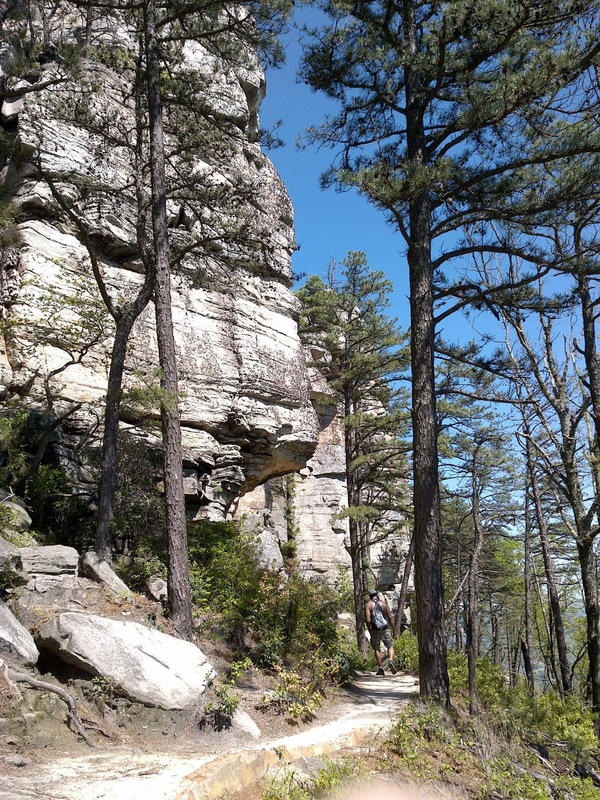 It's called the Jomeokee Trail and it's only 0.8 miles long, from the parking lot around the peak and back. But there's no direct trail from the MST route up there. 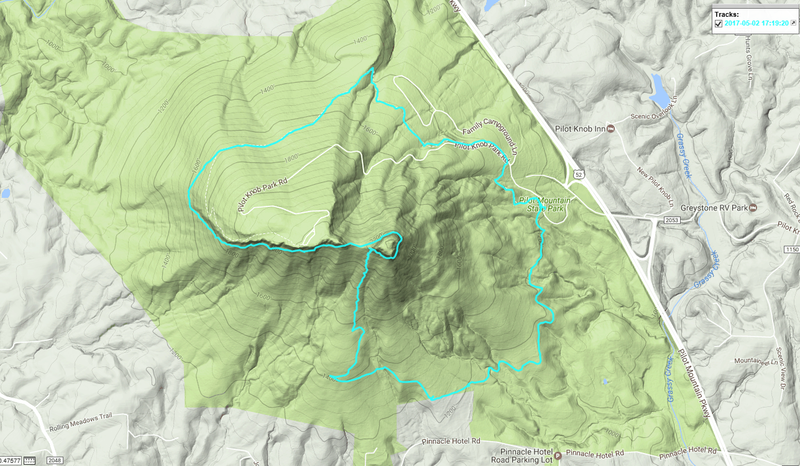 Closest route by trail is nearly three miles. So I missed it again. Well, fast-forward another three years. Yesterday I finally got to see what I had been missing. 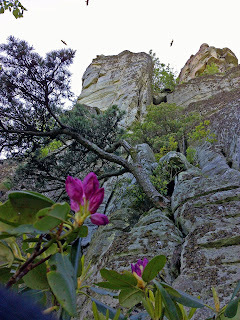 I had the time, and the weather was sinfully delicious--sunny, low humidity, in the mid 70's F.
Though it was early May, the rhododendrons were ready to bloom and the hawks were soaring on the thermals around the summit. It has been an unusually warm spring so far. 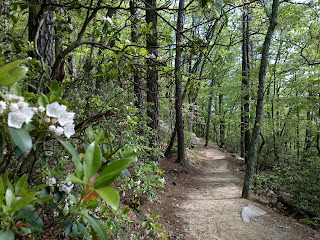 Mountain Laurel were already blooming. That shot of the mountain laurel was taken on the long connecting trail between the Mountains-to-Sea Trail (MST) and the Jomeokee Trail. 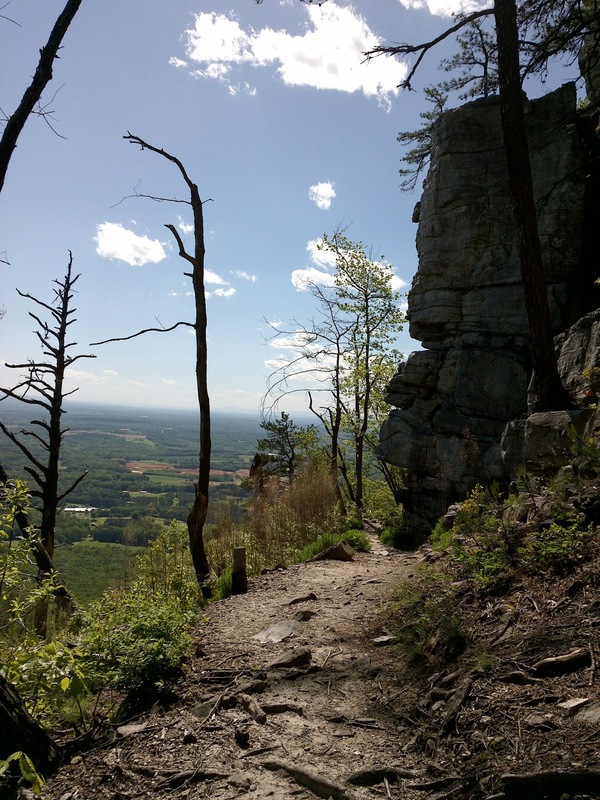 I started at the park office parking lot on the east side of the mountain and hiked most of the big loop well away from the summit then bushwhacked up a ridge to the Jomeokee, then returned to the MST via another wonderfully scenic trail called the Ledge Spring Trail. More on that in a moment. Here's my hiking route--six miles. First here's a static image of the track overlaid on a topographic map. And here's an interactive map from Wikiloc. I'm hoping these maps can do the job best, but since they're controlled by another web site, you never know how the links will perform as time passes. The 'best kept secret' Ledge Spring Trail was arguably even more fun than the Jomeokee, only because it followed the base of a cliff for most of a mile. Here climbers are allowed on the cliff. 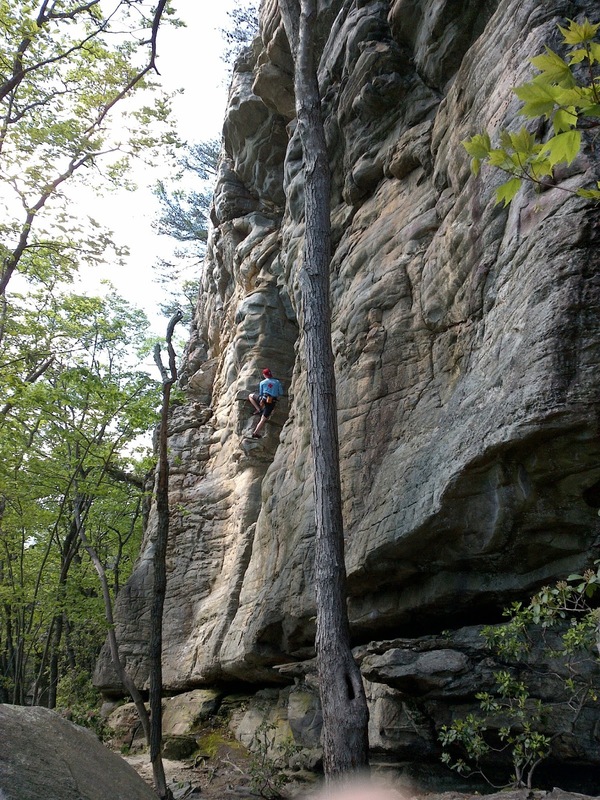 Be sure not to miss the guy in the orange helmet way up high in the first shot. 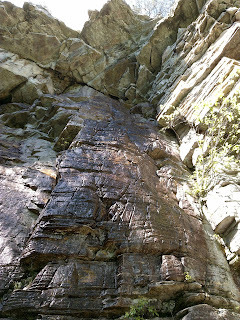 Here's the actual 'Ledge Spring'--a dripping seep that would surely be a magnificent waterfall during a heavy rain. 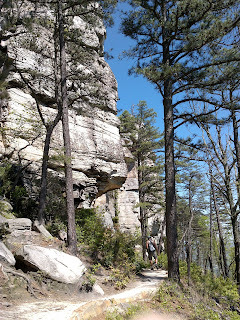 The trails are popular, but on this Tuesday in early May, the crowds were sparse. 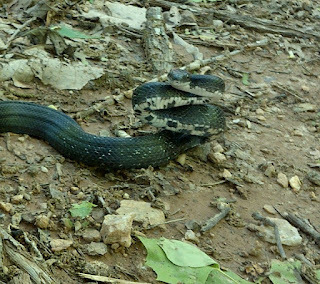 I think I saw more reptiles than people. Most of them were quick moving, colorful lizards--too quick for my camera. 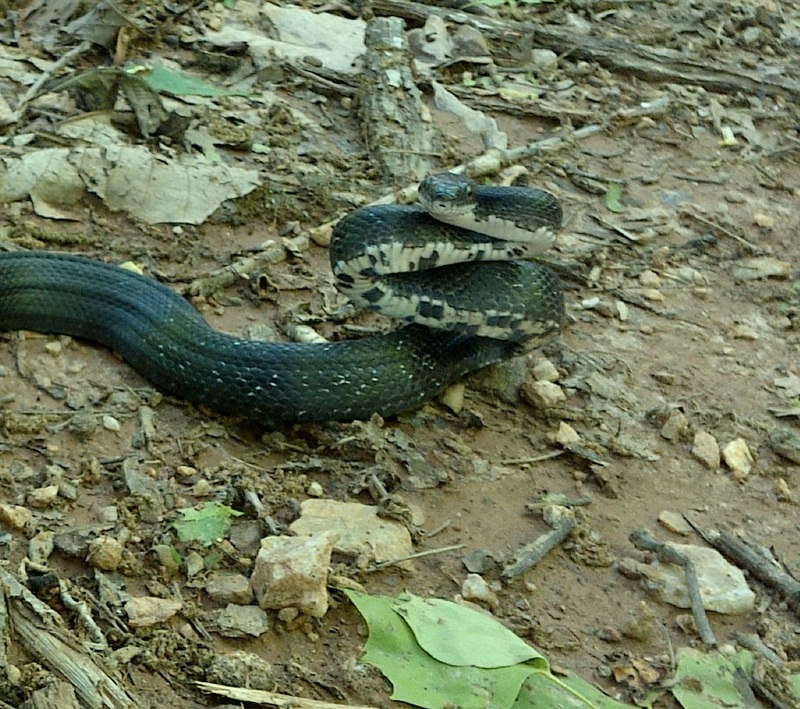 But this young black snake was kind enough to coil up and give me his best threatening pose. So tomorrow I hit Ohio and settle in for some long distance trail hiking. Today's little adventure whet my appetite. I can't wait.